Smokey Mountain NC Vacation Rentals with pool table. 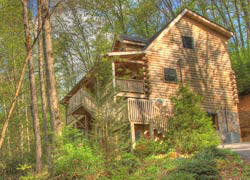 Secluded North Carolina Log Cabin home for rent next to Lake Nantahala. Nantahala N.C.
Lake Nantahala NC Vacation Rental. 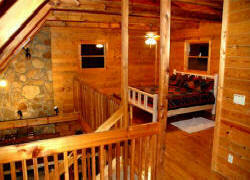 Private NC Smoky Mountain lake vacation log cabin for rent. Secluded, but easy access, romantic honeymoon and clean and comfortable family vacation lake and mountain view log cabin for rent on cool, high elevation Lake Nantahala. 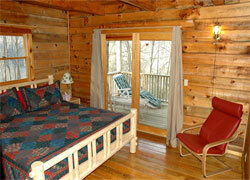 Western North Carolina Smokey Mountain Lake Vacation Log Cabin Rentals. Lake Nantahala - Macon County - NC. Near Murphy, Andrews, Hayesville, Franklin, Bryson City, Cherokee, North Carolina. 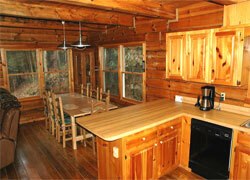 Secluded Appalachian Log Cabin Home with Nantahala Lake Access for Rent by Owner. 4BR 3BA - Max 10 Guests - From $120 per night - Pet Friendly. 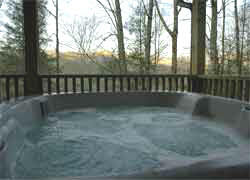 just perfect for your honeymoon or anniversary Smoky Mountain escape. We had a wonderful time on our trip and thoroughly enjoyed the cabin. relaxing in the hot tub and exploring the beautiful area nearby, including the lake. cabin next to beautiful Lake Nantahala. All beds are king size, like this one. In winter the lake level may be lower. 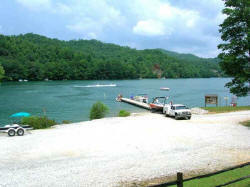 Nantahala Lake Swimming access, boat dock and ramp, just a short walk from your cabin. Bring your boat. A pontoon boat can be rented. To make sure the boat is available, reserve it when you book the cabin. 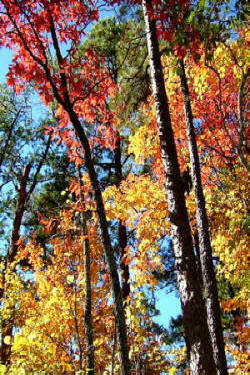 1 Acre Wooded Site with Mountain View and Seasonal Lake View. Due to the location and topography of the site, this cabin is very secluded with no close neighbors. A short, 1/4 mile, 5 minute walk from the lake. You can also drive your car to the lake, there is ample parking. Easy, paved access. This cabin is more private and quieter than lake front cabins. Would you like to get away from it all? 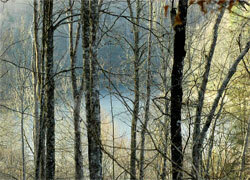 …escape to a secluded, yet easily accessible log cabin in the woods a short stroll from a crystal clear mountain lake? A private place where you can lose track of time? … fish… swim… take a leisurely boat ride? Or just relax on the covered porch and your very private hot tub Jacuzzi spa? 'A Lake Memory' is that place. A secluded vacation log cabin hideaway next to a remote mountain lake between Franklin and Andrews, in South Western North Carolina. Definitely off the beaten path, and well worth the scenic mountain drive. Take your honeymoon, anniversary or family vacation at this clean, comfortable and romantic log cabin just a short stroll from a crystal clear mountain lake, where you can fish, swim, kayak, canoe or rent a pontoon boat. 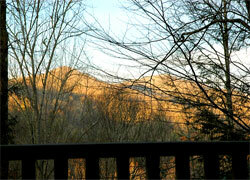 Or just enjoy the seasonal mountain view and peace from the covered porch. Inside, you will find all the comforts of home - a cozy living room with two leather reclining sofas and an electric fireplace. An entertainment center with a 50 inch TV, plus a sound system, VCR, DVD, and DirecTV TOTAL CHOICE PREMIER Satellite television with over 215 channels including HBO, Showtime, Cinemax and Starz movies. 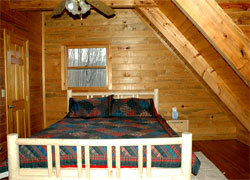 Your log cabin near the lake comfortably sleeps 8 in 4 bedrooms with king beds. 2 of the bedrooms are in the loft, they are separate, but have only 3 walls, the front is open. The basement also has a queen/twin bunk bed. A baby crib is stored in the master bedroom closet. The fully equipped kitchen has everything you need to prepare all your meals at the cabin - refrigerator with icemaker, stove, microwave, blender, coffee-maker, toaster, dishwasher, pots and eating and cooking utensils. Outside, the cabin has a covered porch with a hot tub spa, a picnic table and a charcoal grill. Linens, towels, hairdryers and starting paper goods, and soaps are furnished. Just bring your CDs, DVDs, food and charcoal for the grill. With everything this cabin offers, you may not want to get back in the car. But in the event you should decide to add a little adventure to your getaway, you’ll be just a short drive from white water rafting and kayaking on the Nantahala and Ocoee rivers. Plus all the other great activities the North Carolina Smokies have to offer. 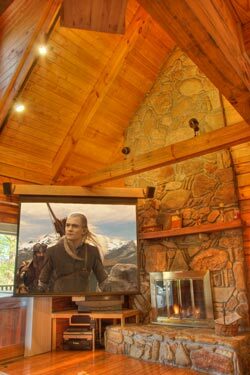 This Smoky Mountain rental cabin is only a scenic 1.5 to 2 hour drive from Asheville NC, Atlanta GA, Chattanooga, Knoxville TN and Greenville SC. Due to the deck, unprotected stairs, and other factors, this cabin may not be safe for children. If you bring children make sure they are at all times closely supervised by a responsible adult. and I'll call you in the evening. There's plenty to do in the area. 'A Lake Memory' is just a short drive from the white water rafting, canoeing and kayaking venues on the Nantahala and Ocoee rivers. That's in addition to all the great activities the North Carolina Smokies have to offer. You may bring your own boat or jet ski, or rent a pontoon boat on Lake Nantahala. Delivers to Lake Nantahala and other area lakes. 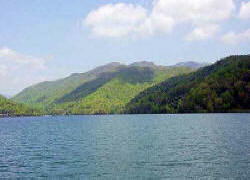 Fishing - A low number of boaters makes Nantahala Lake a great fishing lake. You'll find walleye, crappie, sunfish, trout and bass all available for your private fish fry at 'A Lake Memory'. And below the dam, where the river cascades toward the Nantahala Gorge, you'll find some of the best fly fishing spots in the eastern US. Horseback Riding - Several nearby stables, including Lonesome Dove Stables, offer guided horseback trail riding. Railroad Excursion - Great Smoky Mountains Railroad, in nearby Dillsboro and Bryson City, offers several scenic excursions. Mountain Biking - The nearby Tsali trails offer some of the best mountain biking trails. Bikes can be rented at the Nantahala Outdoor Center . Other nearby things to do - Great Smoky Mountains National Park, Cherokee Indian Reservation, Biltmore House, Cherohala Skyway, Tail of the Dragon motorcycle excursions, Blue Ridge Parkway. Tail of the Dragon and Cherohala Skyway NC and TN Motorcycle excursion road. This cabin is near Nantahala River Gorge trout fly fishing, Tsali Mountain Biking trails, Nantahala White Water Rafting, NOC, Nantahala Outdoor Center. Close to Appalachian and Bartram trail. 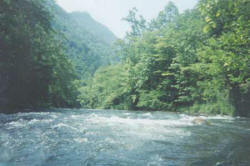 Western North Carolina Smokey Mountain vacation rentals. 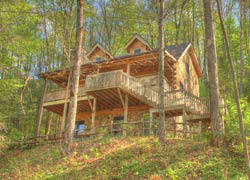 Private NC Smokies vacation log homes and cabins on and near lake for rent. 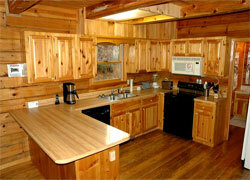 NC log home vacation cabin rentals. Log home vacation cabins for rent near Fontana Lake, Bryson City, the Great Smoky Mountain Railroad, railway, Tail of the Dragon and Cherohala Skyway motor cycle roads, the Blue Ridge Parkway Mountains and the Great Smoky, Smokey Mountains National Park. A $25 reservation fee is required when you submit your booking. We will email you a confirmation with payment instructions shortly after we receive your reservation. Smokey the Bear, on the other hand, spells his name the other way. And if you're wondering about "Smokeys", "Smokys" or "Smokies," they're all correct. Everything was great at the cabin, we had a wonderful time. My family and I had a wonderful time (Their second visit to "A Lake Memory" this year). My 3 year old granddaughter loved playing on the dock and in the lake. We all enjoyed the hot tub and the house. We have decided to make it our regular family-mountain vacation home. Thanks for sharing it with us. Paul and I both want to say we had an incredible time in the "A Lake Memory" home, so much so that we want to return. We would also recommend the place to others. We loved the coziness of the 'cabin' even though it was really large. We loved the fire place, big screen TV, pool table and hot tub. It truly made for a magical honeymoon with memories we will treasure the rest of our lives. Wow, what an amazing time we had at a Lake Memory! It was everything that we expected and more! The accommodations were top notch from the hot tub to the provided robes and even down to the little reading lamps on the bed posts! The lake was also just gorgeous! I am already hoping to plan a family vacation there one day, and I look forward to returning! "Thank you so much for your wonderful, very clean cabin and great communication before and after our stay. We had a fantastic time, and do plan on returning! Belle. B'ham, Alabama." I've been sincerely meaning to e-mail you! However I've been keeping busy trying to catch up at work after the vacation. So the bottom line is: I can't tell you what a wonderful time we had!!!! The cabin was very accommodating and spacious! With 9 of us there it worked out perfectly. We followed your directions exactly and thank God we did, because we had NO problems finding the place. That goes for the "girl" car at least... we traveled in two cars from Jacksonville, FL...us girls got in fine...the boys ended up getting lost and got in late Friday night. Main reason? They left my printed out directions in the trunk in someone's suitcase and stubbornly assumed they could figure out directions on their own... :) I told them so. (Honestly, in the back of my mind I was afraid this whole thing was an internet scam up until we pulled in the driveway--due to it being $ SUCH a great deal! We went rafting Saturday and hiking around the area on Sunday. We never ate out once--on the way in town we stopped at the grocery store and bought enough food to feed a hungry army and cooked and grilled for every meal! It was great! And the dining room table accommodated all of us! We had some rain throughout the trip so we ended up really enjoying the place! So, THANK YOU for such a wonderful vacation!! We were glad to find so many things already there that we needed as well....linens, plenty of towels, robes, wood, satellite radio!, trash bags, etc. We had a wonderful time thanks to your cabin!! I would LOVE to come back in the fall maybe? 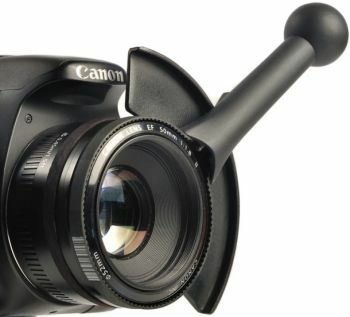 And I have been spreading the word about your rentals :) Again, thank you soooo much Walt! It was the perfect place for a reunion between friends!! Much appreciation, Lacy"
Thank you for your email, but more importantly, thank you so very much for providing such a wonderful cabin for us to enjoy. I had one of the best vacations of my life! Your cabin was everything you described it to be on your website. It was beautiful, very clean and extremely comfortable. Your kindness in permitting me to take my 5 miniature schnauzers provided me the first opportunity to have a vacation that included them. Because my favorite little one was recently diagnosed with cancer, you allowed me to make memories with her that I will cherish forever. Thank you for that! We all had such a wonderful time together! We truly now have "A Lake Memory"! Again Walt, thank you for providing such a wonderful cabin. I do hope to go back sometime. Sincerely, Porsche. Less than 2.5 hours from most of Atlanta is this majestic pristine mountain lake. Lake Nantahala is a crystal clear, remote high elevation lake nestled in North Carolina's Smoky Mountains approximately 120 miles from Atlanta, convenient to Franklin, Andrews and Murphy. The majority of Lake Nantahala's shoreline is US Forest Service land and will never be developed. As a result, the views are not marred by other homes. 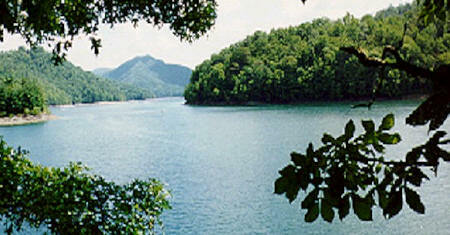 Lake Nantahala is over twice the size of Lake Rabun and has only 1/3 the number of home sites. Lake Nantahala is a true mountain lake with deep, crystal-clear water. At 3200 ft., Lake Nantahala is one of the highest elevation lakes in the Southeast. Lake Nantahala's cool waters are great for fishing mountain trout, pike, bass, catfish and watersports. Nantahala, Natahalia Lake. This Vacation Rental Cabin is on Lake Nantahala, near Nantahala River White Water Rafting, Nantahala Outdoor Center, Nantahala River and Lake Nantahala River trout stream fly fishing, USFS Tsali Recreation Area Mountain Bike Trails, Appalachian Trail hiking, Joyce Kilmer Memorial Forest, Lake Fontana and Fontana Dam, Great Smoky Mountains National Park, Cades Cove, Great Smoky Mountains Railroad Excursions Train, Cherokee Indian Reservation, Cherokee Harrah's Casino. A 1.5 to 2 hour scenic drive from Asheville NC airport, Biltmore House in Asheville, Atlanta GA, Knoxville TN and Chattanooga TN. Less than 1 hour to skiing at Cataloochee NC, near Maggie Valley. Western North Carolina holiday, vacation rental home, cabin, chalet close to Great Smoky Mountains National Park, Cades Cove, Blue Ridge Parkway, spectacular waterfalls, antique and Appalachian craft shopping, Smoky Mountains Country Club Golf Course, skiing, horseback riding, whitewater rafting, hiking, mountain biking, & kayaking on the Nantahala River. Ride the Great Smoky Mountains Railway. Visit the nearby Cherokee Indian Reservation and shop for Native American Indian crafts. Only a short scenic drive from the Appalachian Hiking Trail, Biltmore House and Gardens, Blowing Rock, Cherohala Skyway, Tail of the Dragon, Deals Gap, Deal's Gap, Cherokee Bear Zoo & Exotic Animals, Cherokee Indian Museum, Cherokee Indian Reservation, Deep Creek Tubing, Fields of the Wood, pontoon boating on Fontana Lake and Dam, Great Smoky Mountains National Park, Great Smoky Mountains Railway, Harrah's Cherokee Casino, Joyce Kilmer Memorial Forest, Linville Caverns, Mountain Farm and Museum, Nantahala National Forest, Nantahala River Rafting, Oconaluftee Indian Village, Pisgah National Forest, Santa's Land, Smoky Mountain Country Club, Soco Gardens Zoo, Tribal Bingo, Tsali mountain biking, Unto These Hills, Darnell's Corn Maze. The Nantahala River, located in the US Forest Service Nantahala National Forest, is one of America's favorite whitewater playgrounds. Its ideal location at the edge of the Great Smoky Mountains National Park, close to Atlanta GA, Knoxville TN, Greenville SC, Asheville NC and just a short distance from Murphy, Andrews, Robbinsville, Franklin, Cherokee and Bryson City, NC makes the Nantahala River convenient to mountain vacationers. More.. Vacation homes for rent in North Carolina. Vacation homes for rent by owner. cabin rentals on the nantahala river. vacation house rentals. Water lakefront vacation home for rent in Georgia. North carolina vacation house rentals, north carolina travel, north carolina tourism, north carolina vacation, bryson city cabin rentals, asheville north carolina, ashville north carolina, boone north carolina, cherokee north carolina , blowing rock north carolina, franklin north carolina, brevard north carolina. whitewater rafting in north carolina, tennessee whitewater rafting, nanthala, nantehala, nantahale, nantala, nantahala river white water rafting, nantahala river kayak, nantahala river rafting, nantahala national park, ocoee river rafting, white water rafting, nantahala outdoor center, nantahala national forest, nantahala river lodging, nantahala river cabin rentals, great smoky mountains cabin rentals, cabin smoky mountains. mountain vacations of north carolina, smokey mountain vacations, north carolina mountain vacations. georgia mountain vacations, smoky mountain vacations. Fall autumn leaf color season calendar, fall leaf season calender.